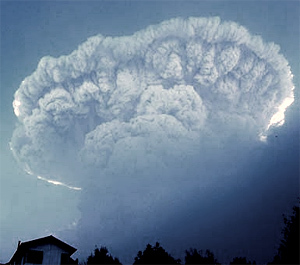 A significant danger from volcanoes is the volcanic ash that can be ejected high into the atmosphere and cause severe local or regional damage, or even world wide longer term disruption. Luckily, the majority of current and recent volcanic activity has not resulted in severe damage beyond local vicinities. But there are lots of sleeping giants out there that could potentially change the lives of populations well beyond the local. There is also a special category of volcanoes reserved specifically for those that would cause extreme damage, the super volcano. Given the recent eruption of Iceland’s Eyjafjallajökull and the anticipated eruption of neighboring Katla, without regard for the category of the volcano let’s look at something that is common to all, but in varying degrees of impact… Volcanic Ash. Volcanic Ash is made of tiny jagged hard pieces or particles of volcanic glass, rock, and minerals, and is very abrasive and somewhat corrosive. What do volcanoes release into the atmosphere? Volcanic Ash is HEAVY – Roof collapse of buildings when ash begins to reach about 4 inches depth (10 cm) for weaker structures and gets worse with depth. Danger zone depends entirely upon magnitude of eruption versus distance from ground zero and prevailing wind direction. How does one prepare for a threat resulting from a significantly large eruption? Assuming it’s not a super volcano (which would require orders of magnitude greater level of readiness – but fortunately is very rare), the answer will depend on your exposure risk based on your geographical location. Only you know where you live, and can choose your best plan of insurance. Check your financial exposure to possible related equities, always keep at least a minimum comfort level of food storage (a personal choice), and come to grips with the fact that we as humans are tiny in comparison with the power of earth’s forces.